Bamburgh Castle is a castle on the northeast coast of England, by the village of Bamburgh in Northumberland. It is a Grade I listed building. 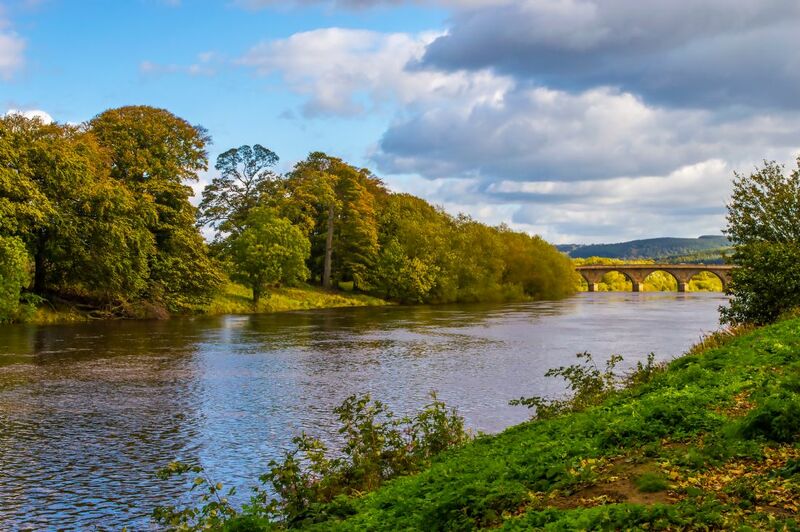 The site was originally the location of a Celtic Brittonic fort known as Din Guarie and may have been the capital of the kingdom of Bernicia from its foundation in c. 420 to 547. 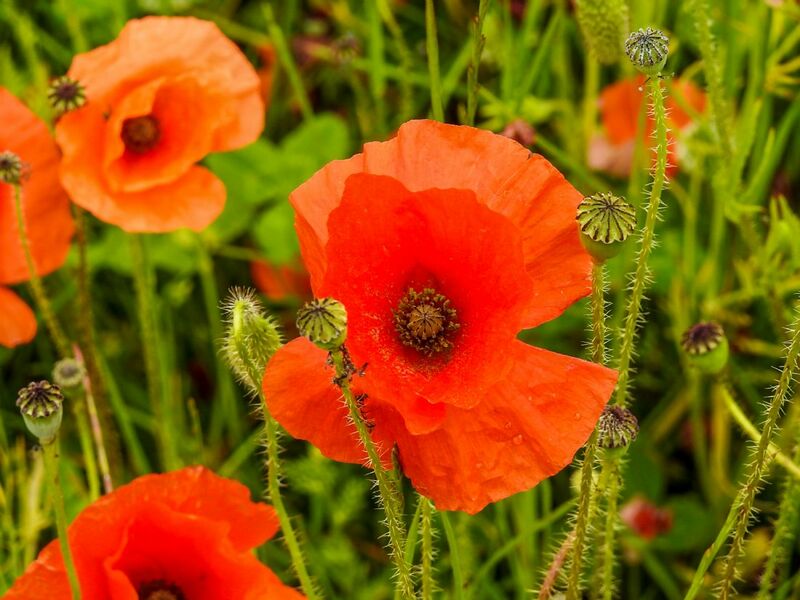 After passing between the Britons and the Anglo-Saxons three times, the fort came under Anglo-Saxon control in 590. The fort was destroyed by Vikings in 993, and the Normans later built a new castle on the site, which forms the core of the present one. After a revolt in 1095 supported by the castle's owner, it became the property of the English monarch. Situated off the Northumberland coast, Coquet Island is a vibrant seabird sanctuary, which is home to the UK’s only roseate tern breeding colony. 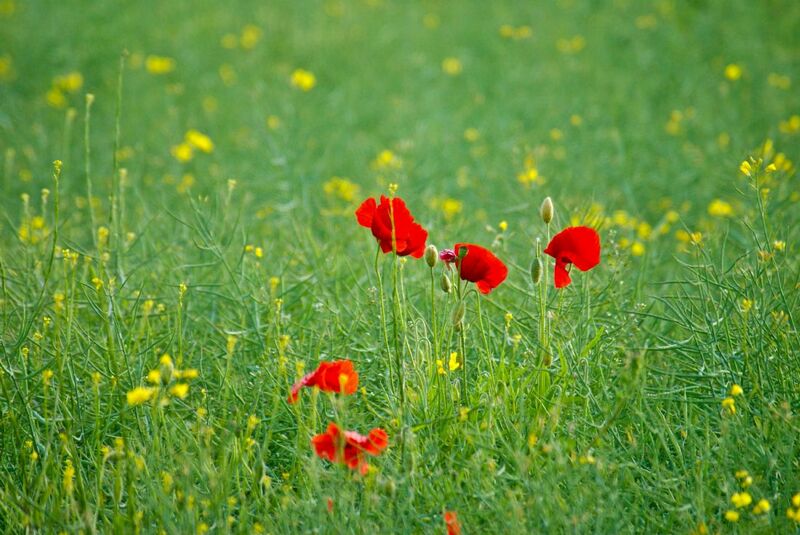 It is also an important site for nesting puffins and common, Sandwich and Arctic terns. 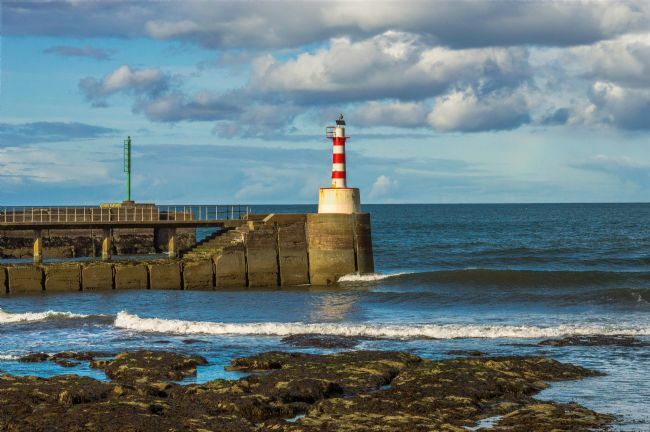 Amble Pier Lighthouse photos – Northumberland Coast. This small light is one of two at the mouth of the River Coquet at Amble in Northumberland. 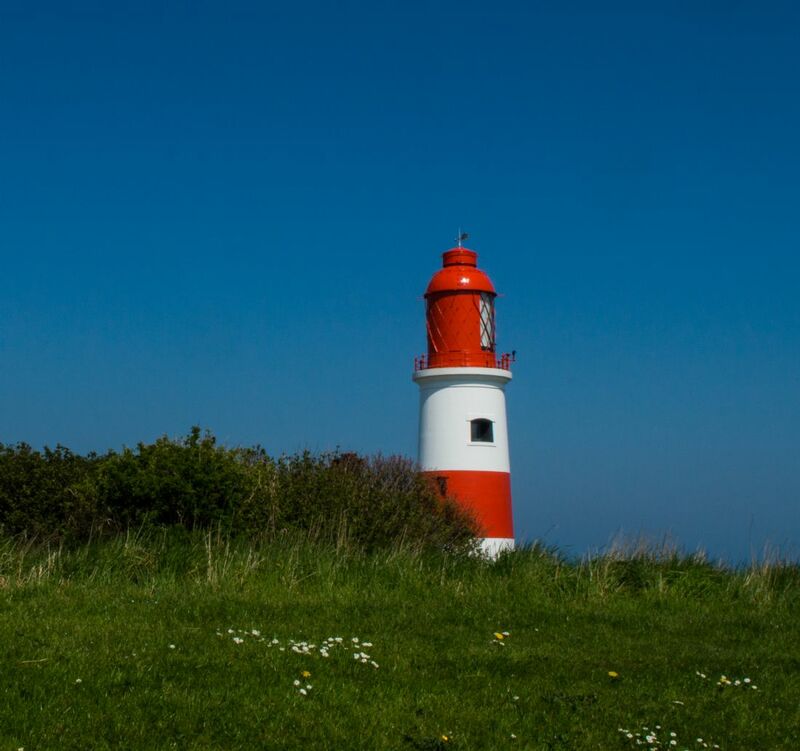 Built in the early 20th century it's flashing red light provides a navigational aid for fishing boats and pleasure craft entering Amble Harbour. The last remnants of world war 2 defences along the northumberland coast. Dunstanburgh Castle is a 14th-century fortification on the coast of Northumberland in northern England, between the villages of Craster and Embleton. 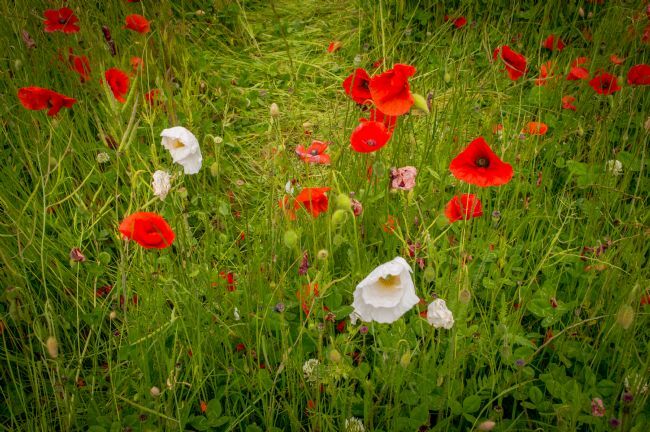 The castle was built by Earl Thomas of Lancaster between 1313 and 1322, taking advantage of the site's natural defences and the existing earthworks of an Iron Age fort. 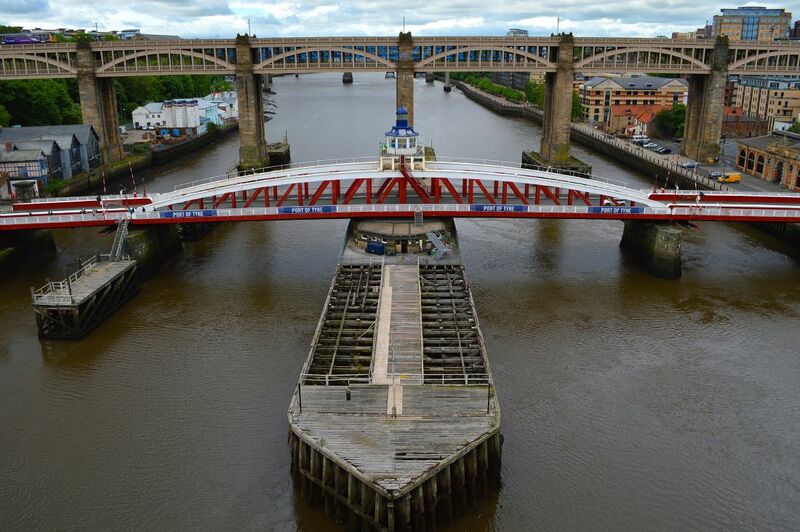 Despite belief the Swing Bridge was the fourth bridge to be built spanning the Tyne by the River Tyne Commission in 1851, It was first used to road traffic in 15th June 1856 and then opened up to river traffic on 17th July 1856. 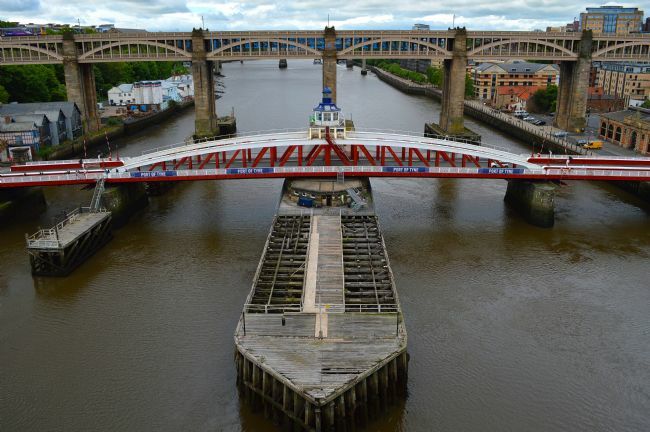 It ceased operations to river traffic around December 1981 although the bridge still swings four times a week. 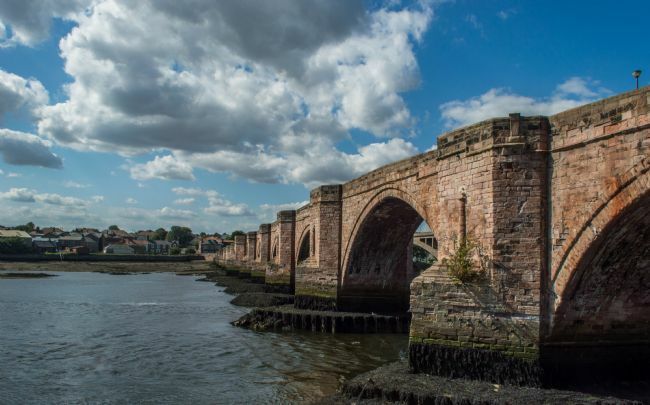 The quayside at Berwick extends about 350m downstream from Berwick Old Bridge, on the northern bank of the River Tweed. It probably has its origins in medieval times and the earliest reference may date to 1333. Several 16th century maps show the quay following the same general outline as it does today. Little Dock and New Quay are shown on 18th century maps and by the 19th century there was a series of buildings on the quay. These include the Harbour Office, Berwick Shipping Company Office and Berwick Shipping Company and Newcastle Warehouse. A ramped approach road onto the quay was probably built in 1825 and would have meant the demolition of some quayside buildings, including the Harbour Office which was rebuilt against the ramp after this date. 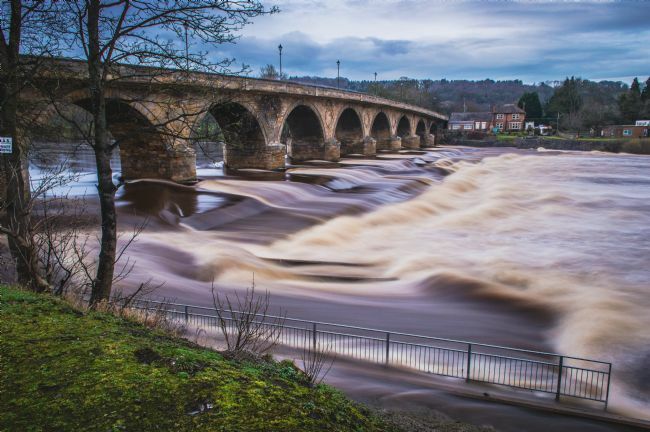 Also known as Old Bridge, the 15-arch red sandstone Berwick Bridge is the most venerable of the three bridges crossing the River Tweed at Berwick on the Scottish-English border. It was the only bridge at this point for 300 years or so, and is now a Grade 1 listed structure and Scheduled Ancient Monument. 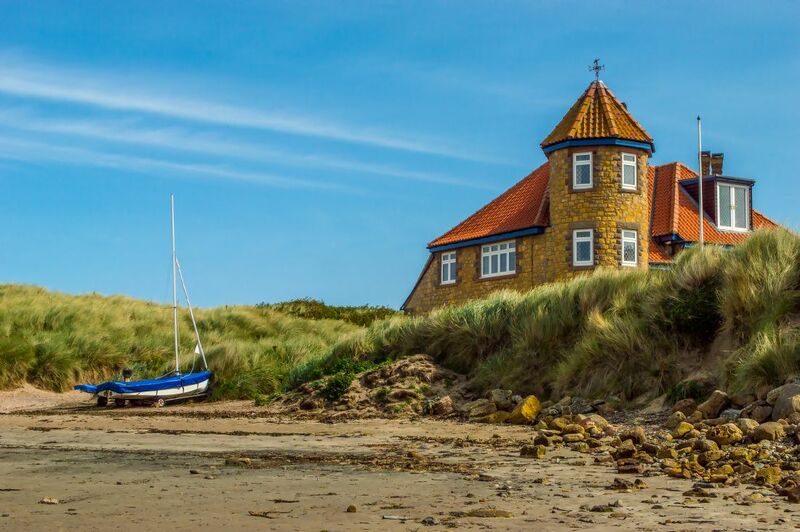 Beadnell is a charming coastal village lying between rolling farmland and the dune fringed stretch of Beadnell Bay. Old cottages and pretty houses line the coastal road and in the summer the small harbour is filled with colourful boats. 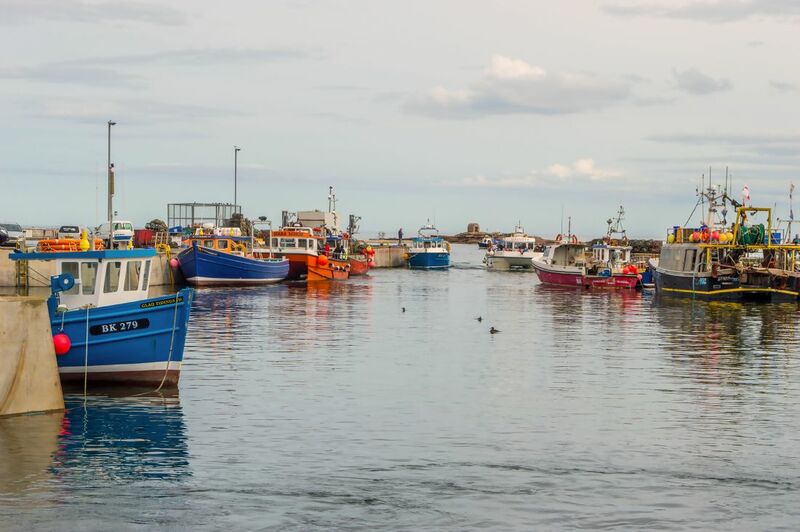 Beadnell is the only west-facing harbour on the east coast, making it an enchanting place to watch the sun set. The bay is home to an important colony of little and Arctic terns that can be seen swooping overhead. The beautiful and very popular Beadnell Bay Beach is situated in Beadnell, Northumberland. This is a beach that is distinctive because of its unique horseshoe shape and boasts soft golden sands. It is also a part of the Heritage Coastline, which gives it even more of a unique appeal for visitors. Beadnell Bay Beach offers a host of amenities and facilities for the convenience of visitors as well as offering access to a variety of activities. 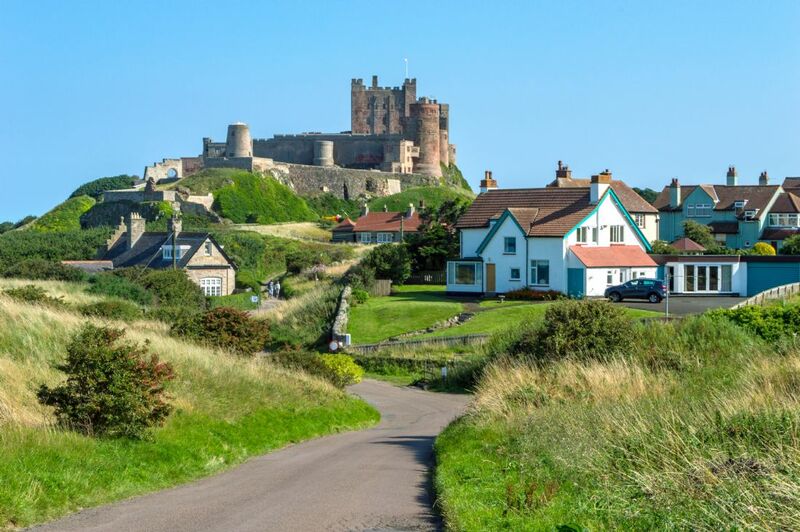 Bamburgh Castle occupies a strong defensive position on top of a long volcanic crag overlooking the North Sea. The site has been occupied since pre-historic times and, by the late Iron Age, was an important settlement of the Votadini tribe. 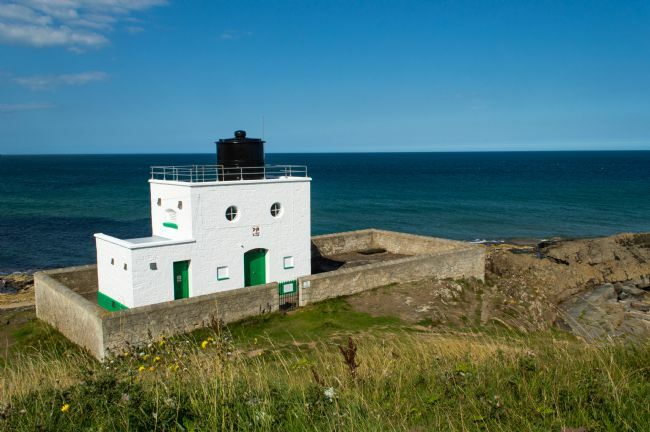 A beacon was established on the site during the Roman era and it is possible Bamburgh acted as part of the warning system associated with the Saxon Shore defences (such as at Scarborough). By the late fifth/early sixth century a fortified settlement had become established at Bamburgh. This was captured in AD 547 by the Anglo-Saxon King Ida and thereafter Bamburgh evolved into the capital of the Kingdom of Bernicia. 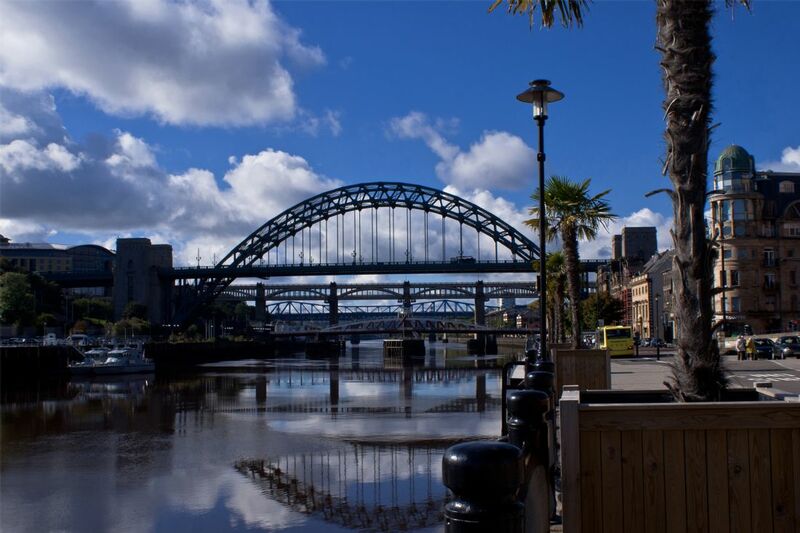 It remained an important caput even after that domain merged with Deira to become the Kingdom Northumbria. 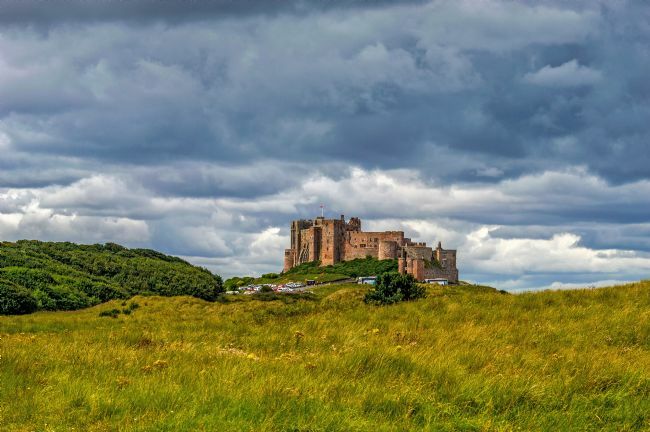 Bamburgh was attacked and destroyed by the Vikings in AD 993. 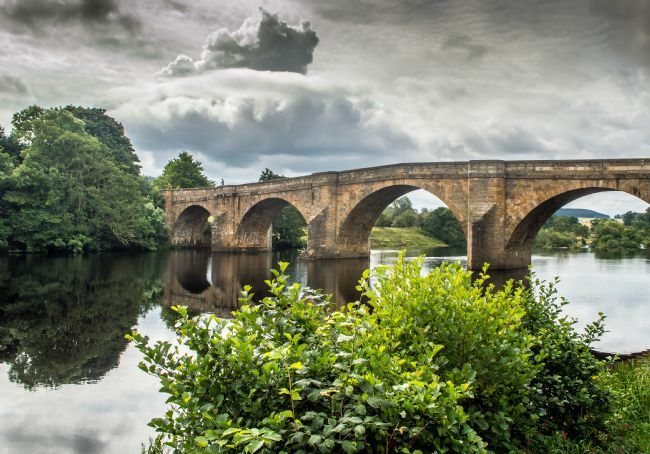 The market town of Bellingham sits on one of Northumberland's prettiest stretches of water, the north bank of the River North Tyne. This river runs through some of England's finest scenery as it follows its course below fells and across Forest Park where the waters are often shaded by wooded banks as it wends its way through rich grazing pastures. All around is quiet and tranquil, cattle graze and newborn lambs frollick. 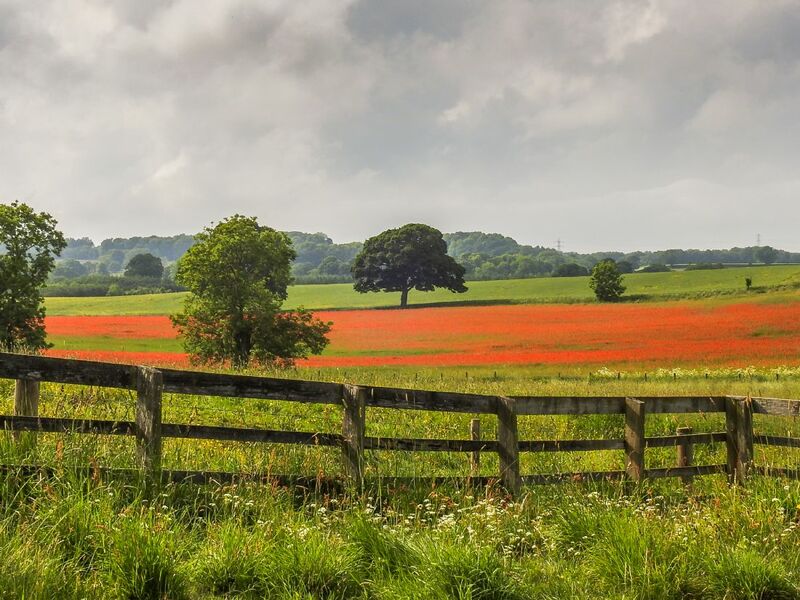 The beautiful stretch known as the Penine Way runs through south through Bellingham en route towards Hadrians Wall, it is in an area that is steeped in history dating back to the Bronze Age. This is evidenced by the finding of stone and bronze axes and a single burial cairn. 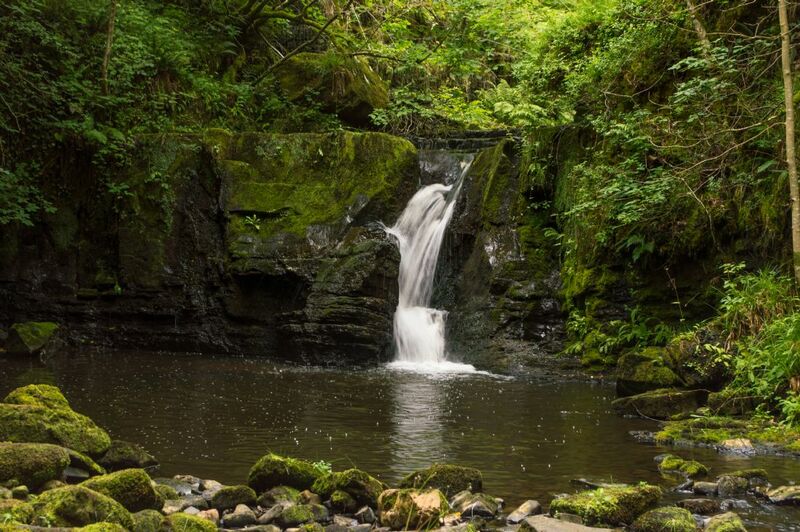 A 3 mile ‘there and back’ walk to visit the enchanting waterfall, Hareshaw Linn, in Northumberland. 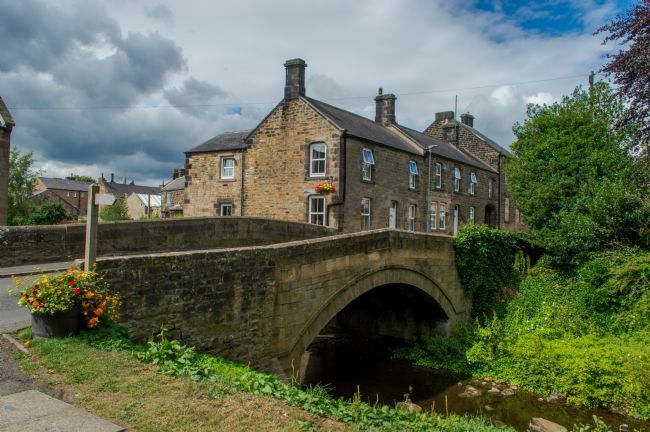 The walk leaves the village of Bellingham and follows the pretty stream, Hareshaw Burn, up along the gorge through beautiful woodland to reach the impressive waterfall. The bridge was built to carry a railway track. Engineered by W G Laws , W E Jackson & Co. of Newcastle upon Tyne built the bridge's foundations and masonry, and Hawks, Crawshay and Sons of Gateshead manufactured the ironwork. 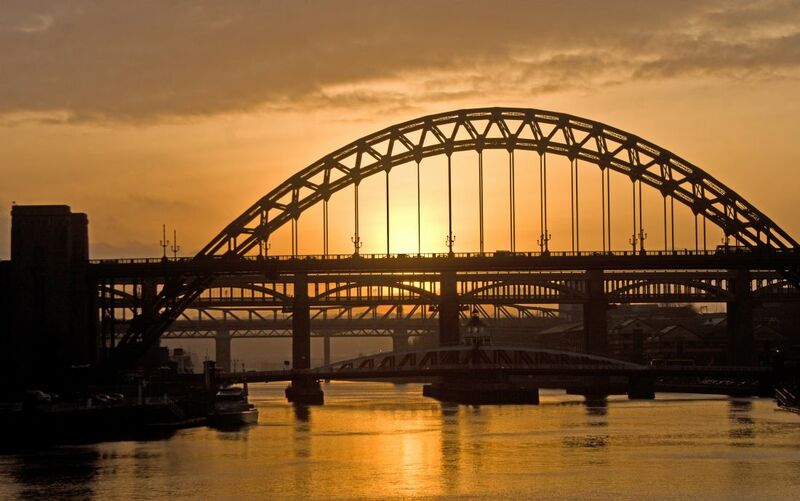 The bridge was opened to rail traffic on 6 October 1876. 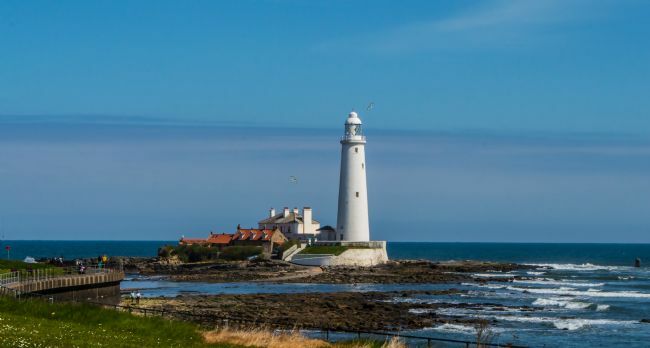 St. Mary's Lighthouse is on the tiny St Mary's (or Bait) Island, just north of Whitley Bay on the coast of North East England. The small rocky tidal island is linked to the mainland by a short concrete causeway which is submerged at high tide. 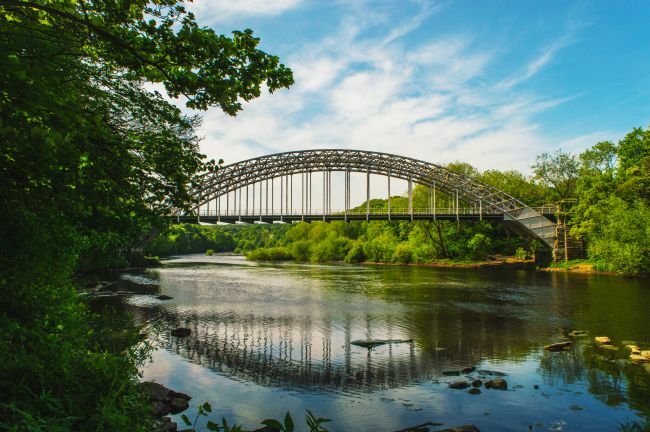 The Hagg Bank Bridge (known locally as the Points Bridge) is an early example of an arch suspension bridge. When it was built in 1876 by W.G. 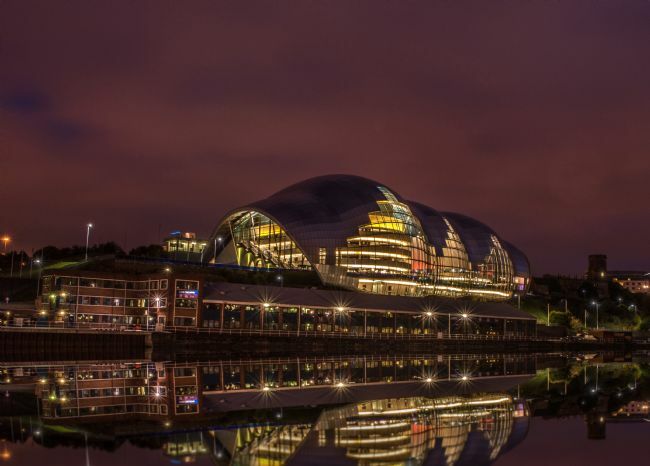 Laws, who later became City Engineer for Newcastle, for the Scotswood, Newburn and Wylam Railway Company its design was ahead of its time. 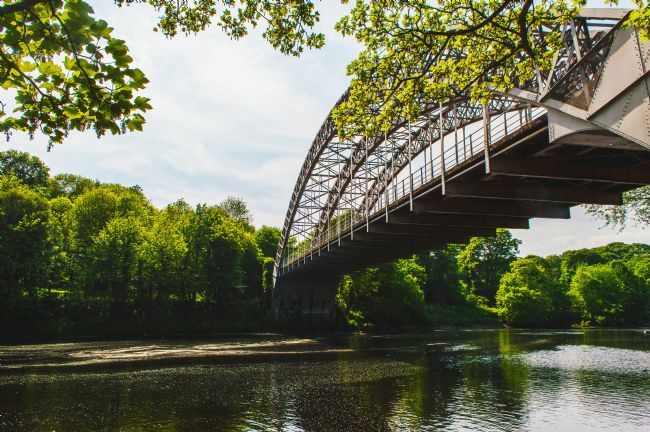 The bridge allowed trains to cross the river from North Wylam Station to join the Newcastle to Carlisle line at the West Wylam Junction. 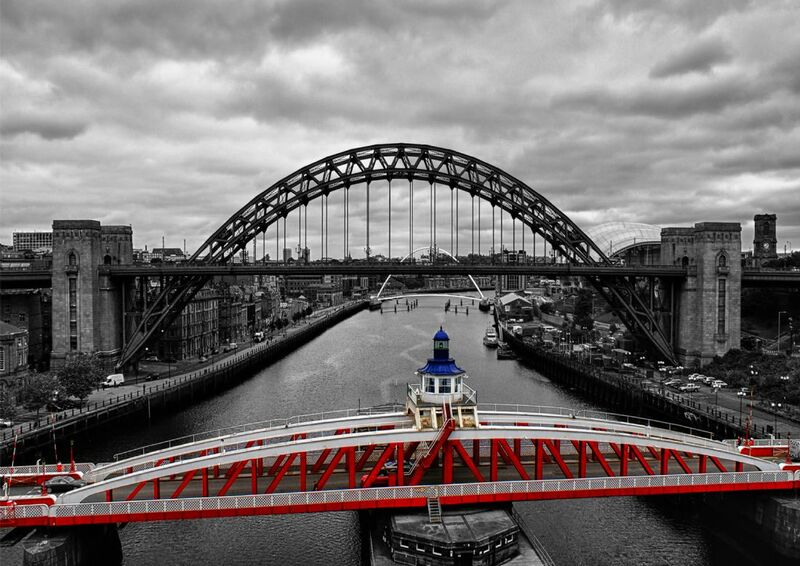 It cost £16,000 to build and Hawks, Crawshay & Sons of Gateshead cast the ironwork. The bridge paved the way for new developments in bridge building. The Tyne Bridge (1928) in Newcastle and the Sydney Harbour Bridge (1932) in Australia are both arch suspension bridges. Wylam Bridge is a road bridge in Northumberland, England linking the residential area of North Wylam and neighbouring villages of Heddon-on-the-Wall, and Horsley with the railway station in South Wylam as well as west Gateshead, including the villages of Ryton and Crawcrook. 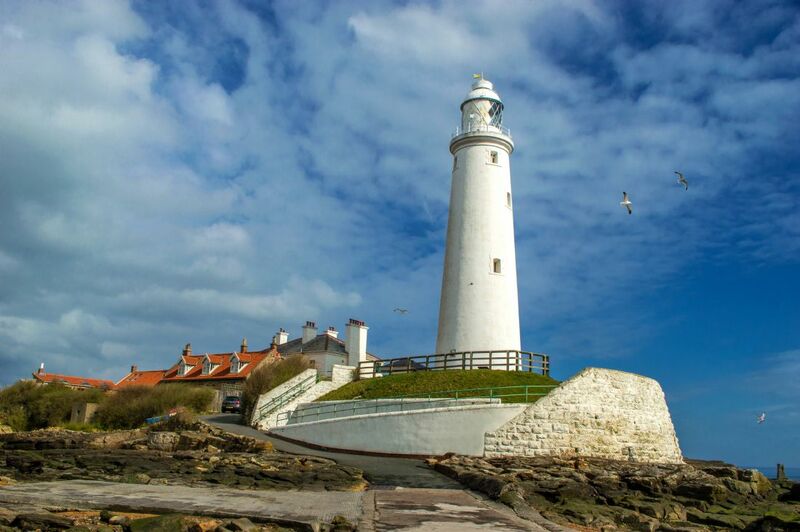 Souter Lighthouse is a lighthouse located in the village of Marsden in South Shields, Tyne & Wear, England. 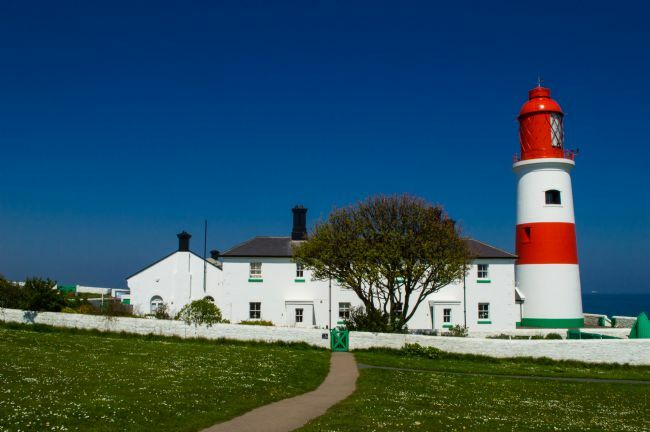 Souter was the first lighthouse in the world to be actually designed and built specifically to use alternating electric current, the most advanced lighthouse technology of its day. An almost invisible Bamburgh Castle due to an intense sea fog. 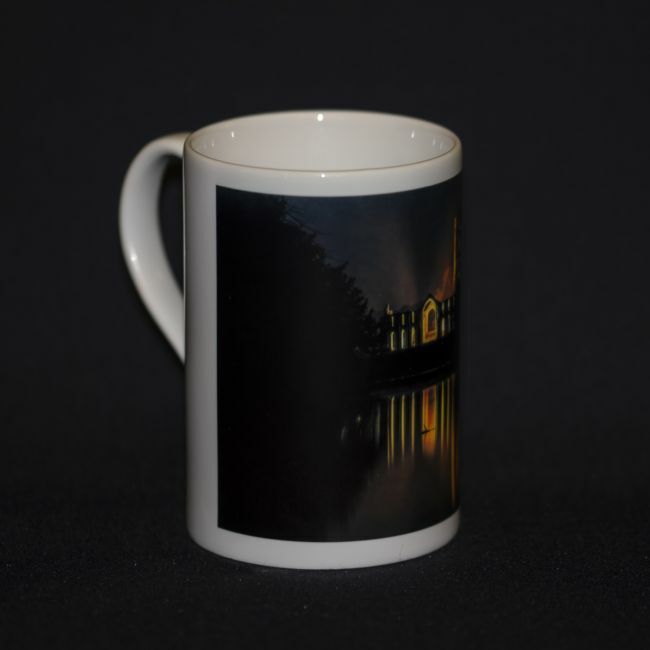 Image shows the castle just as the fog was lifting. 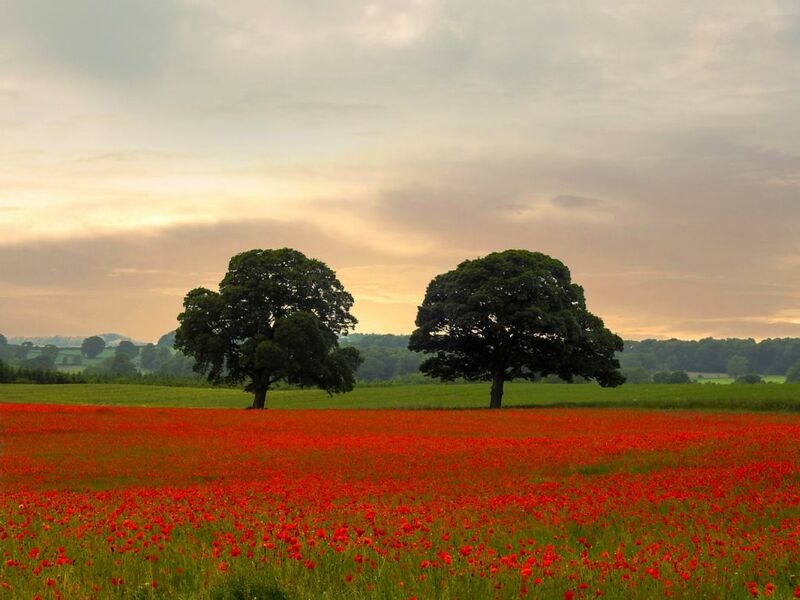 Sunset over the poppy fields near Aydon Castle, Corbridge, Northumberland. 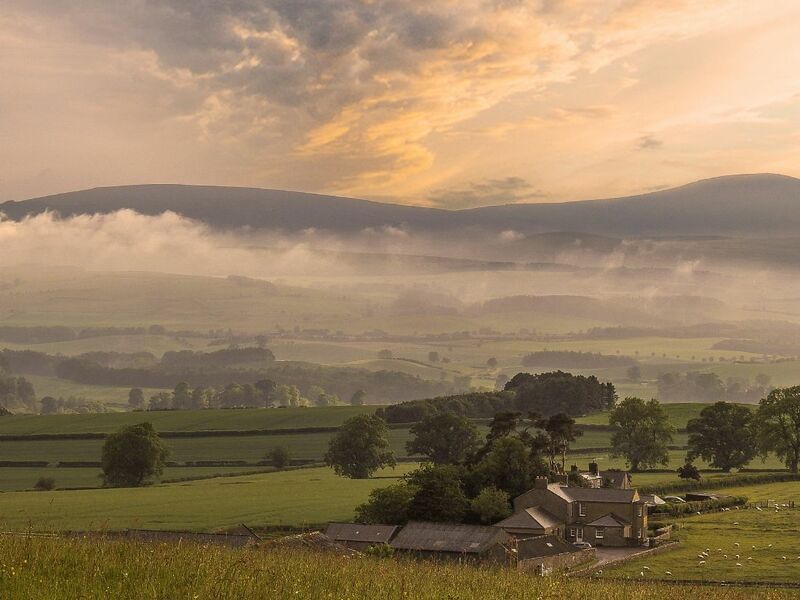 Shrouds of mist float below the Simonside Hills after an intense thunder storm. 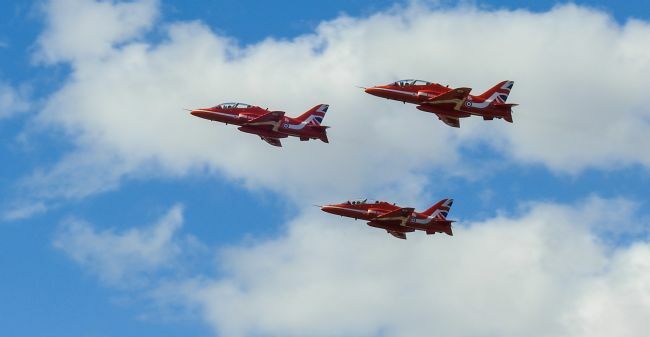 The Red Arrows have a prominent place in British popular culture, with their aerobatic displays a fixture of British summer events. The badge of the Red Arrows shows the aircraft in their trademark diamond nine formation, with the motto Éclat, a French word meaning brilliance or excellence. 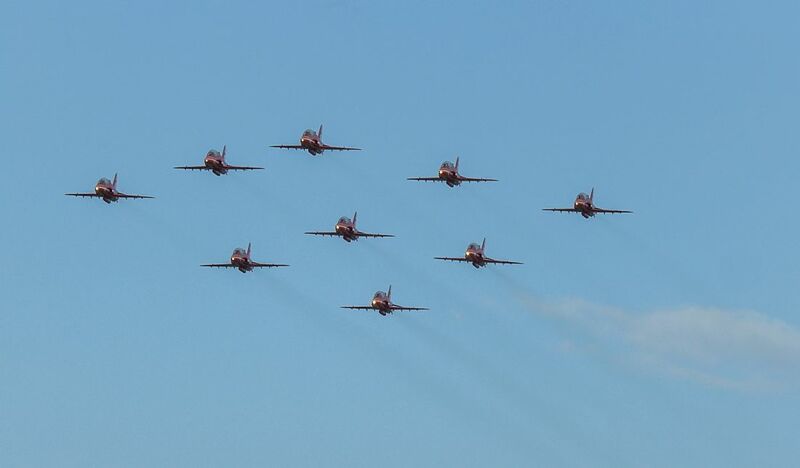 Initially, they were equipped with seven Folland Gnat trainers inherited from the RAF Yellowjacks display team. 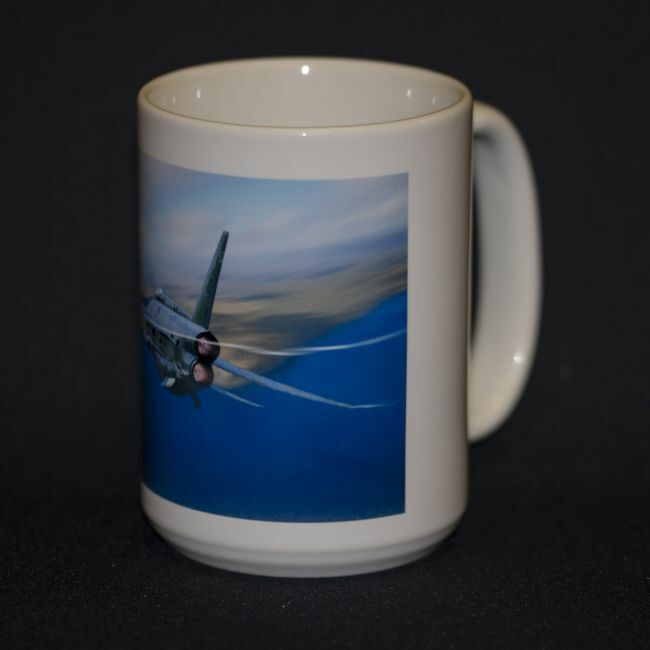 This aircraft was chosen because it was less expensive to operate than front-line fighters. In their first season, they flew at 65 shows across Europe. In 1966, the team was increased to nine members, enabling them to develop their Diamond Nine formation. In late 1979, they switched to the BAE Hawk trainer. The Red Arrows have performed over 4,800 displays in 57 countries worldwide. Craster is a small fishing village on the Northumbrian coast of England. 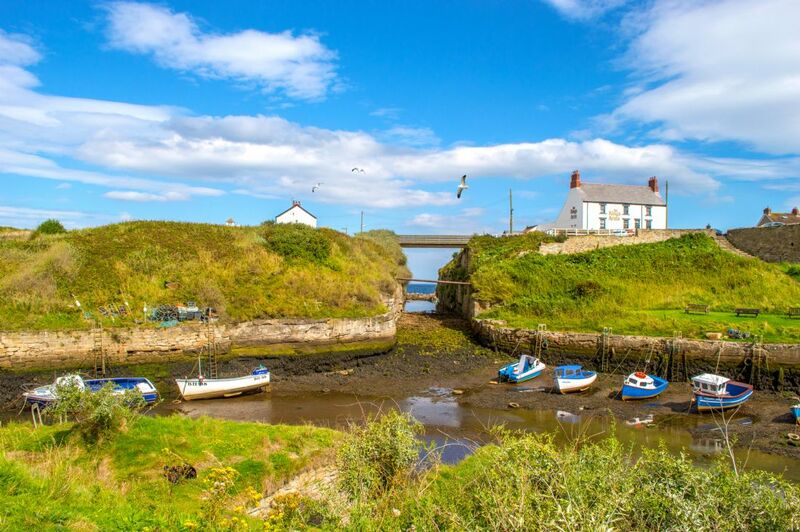 It has a small harbour and offers a view northwards along the rocky shore to the ruins of Dunstanburgh Castle. This is the nearest point of access to the castle and the approach must be made on foot as there is just a grassy path. The next village to the north is Embleton. 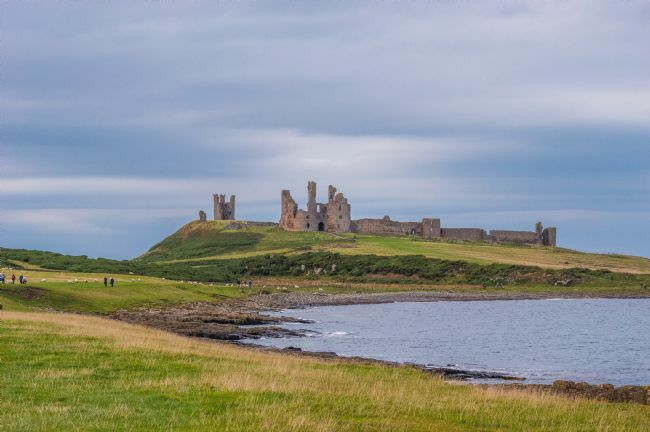 Dunstanburgh Castle is a 14th-century fortification on the coast of Northumberland in northern England, between the villages of Craster and Embleton. The castle was built by Earl Thomas of Lancaster between 1313 and 1322, taking advantage of the site's natural defences and the existing earthworks of an Iron Age fort. 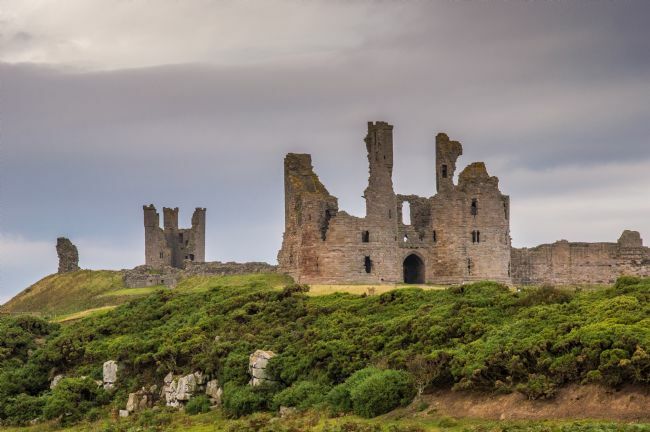 Thomas was a leader of a baronial faction opposed to King Edward II, and probably intended Dunstanburgh to act as a secure refuge, should the political situation in southern England deteriorate. 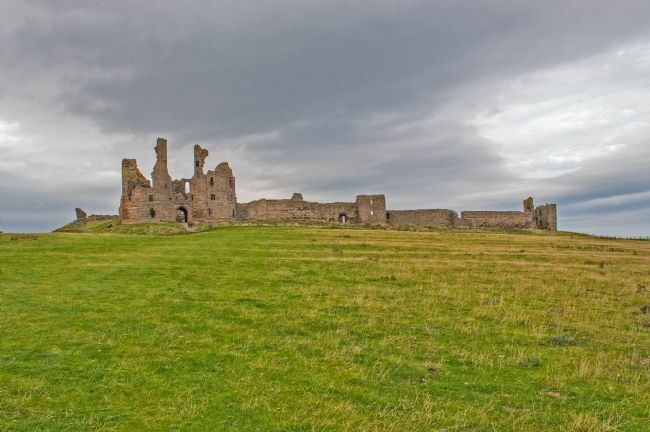 The castle also served as a statement of the earl's wealth and influence, and would have invited comparisons with the neighbouring royal castle of Bamburgh. Thomas probably only visited his new castle once, before being captured at the Battle of Boroughbridge as he attempted to flee royal forces for the safety of Dunstanburgh. Thomas was executed, and the castle became the property of the Crown before passing into the Duchy of Lancaster. 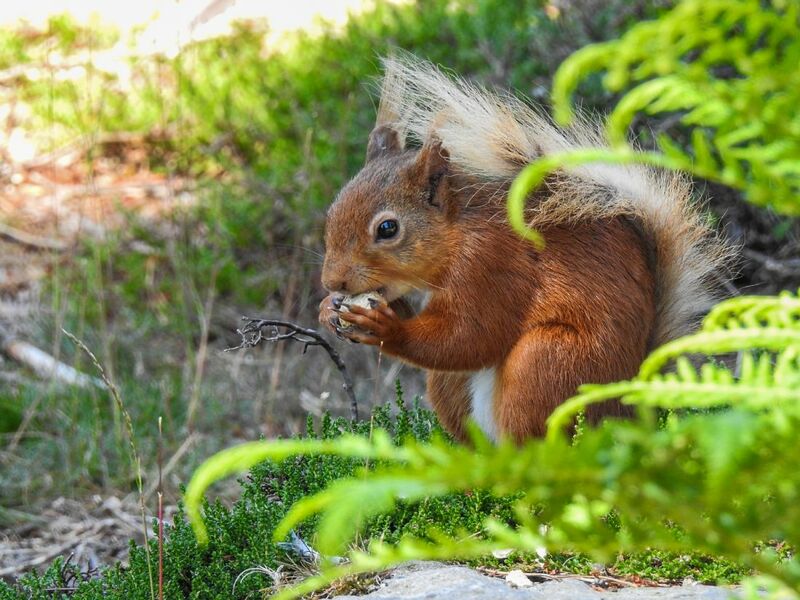 The red squirrel or Eurasian red squirrel (Sciurus vulgaris) is a species of tree squirrel in the genus Sciurus common throughout Eurasia. 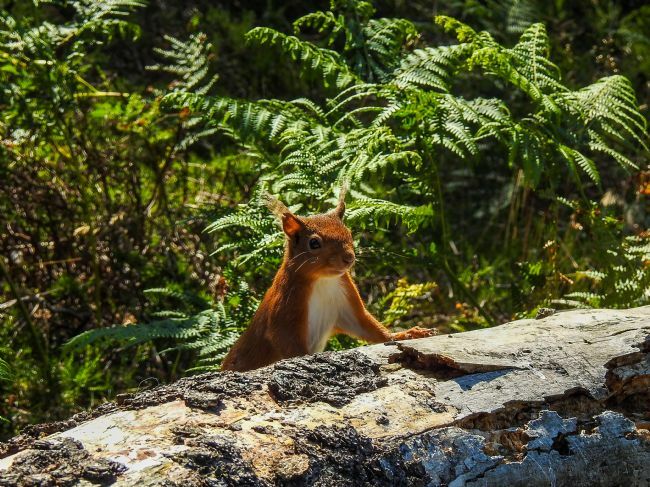 The red squirrel is an arboreal, omnivorous rodent. 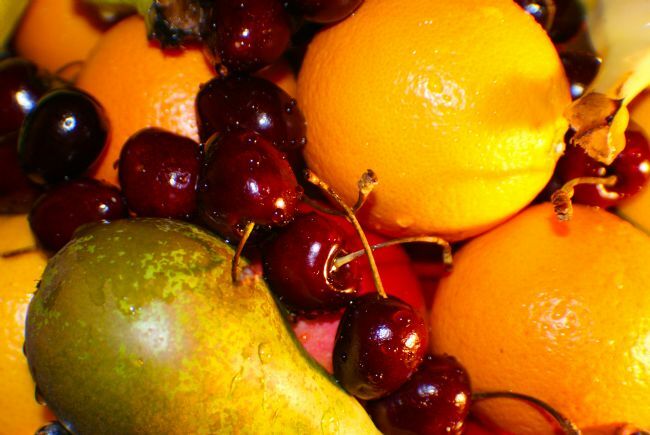 In Great Britain, Italy and Ireland, numbers have decreased drastically in recent years. This decline is associated with the introduction by humans of the eastern grey squirrel (Sciurus carolinensis) from North America and habitat loss. 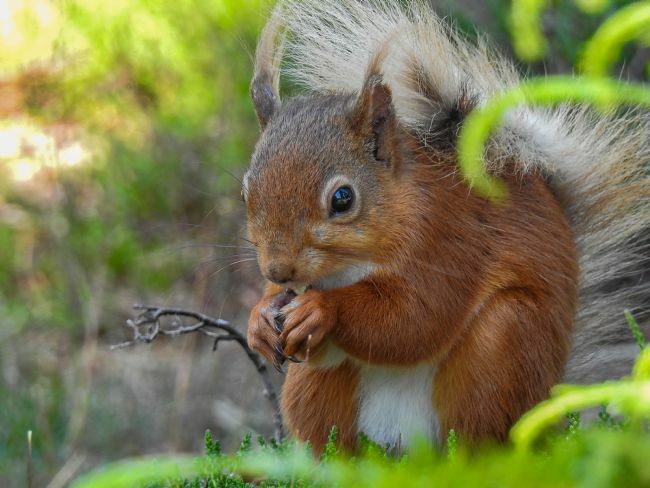 Due to this, without conservation the species could be extirpated from Britain by 2030. Reached between the tides via a short causeway, St. Mary's has all the fascination of a miniature, part-time island. The Lighthouse, completed in 1898 on a hazardous coast for shipping, remained operational until 1984 when it was superseded by modern navigational techniques. Since then the Lighthouse and former keepers' cottages have been operated as a visitor centre by North Tyneside Council. 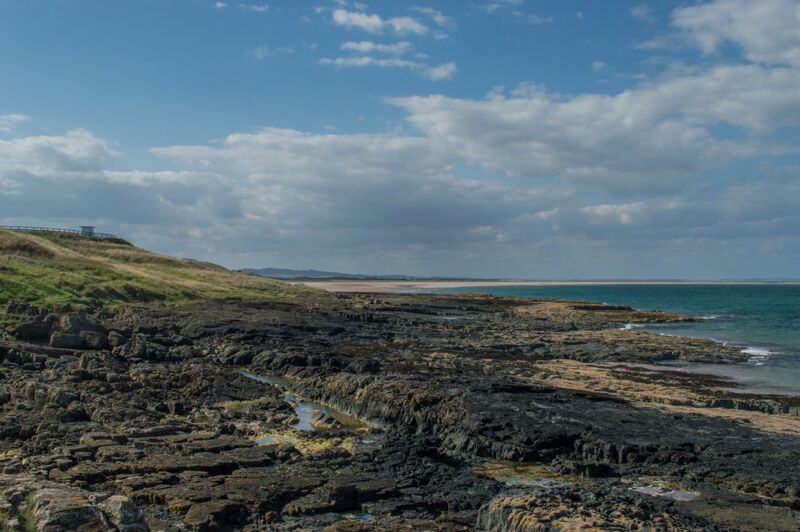 The surrounding Nature Reserve contains an area of rockpools, clifftop grassland, a beach and newly created wetland habitats. 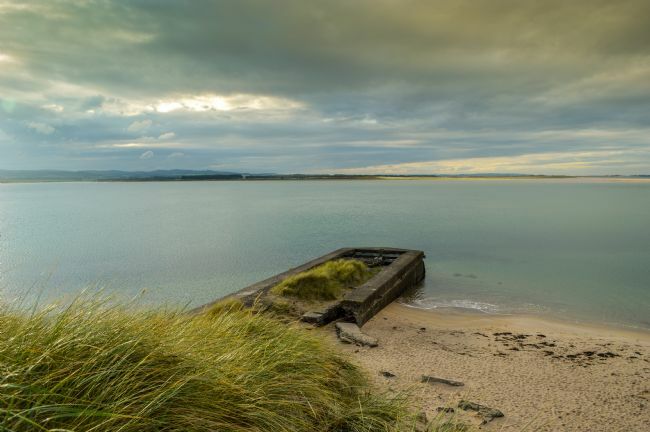 The remains of the old pier at Budle Bay which was once the loading bay for boats with material from a nearby quarry. Once a busy port in its day, it is now a small tranquil in let. 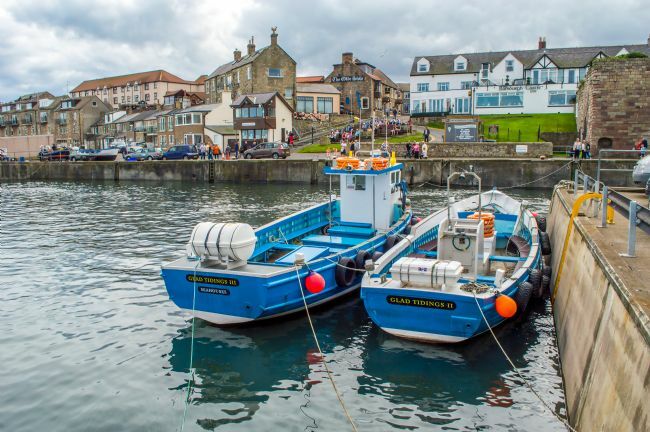 The harbour is a Grade II listed structure. 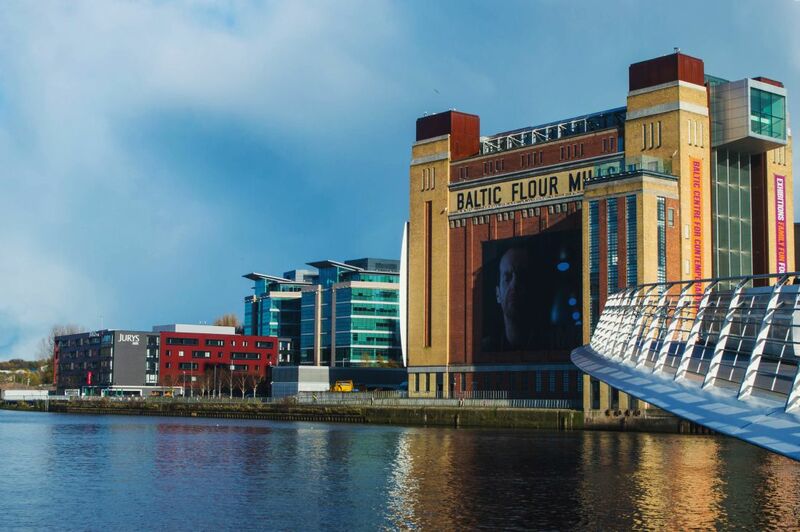 It only caters for boats less than 9.1m long. A view of Chollerford Bridge, Northumberland spanning the River Tyne taken from the nearby public house. 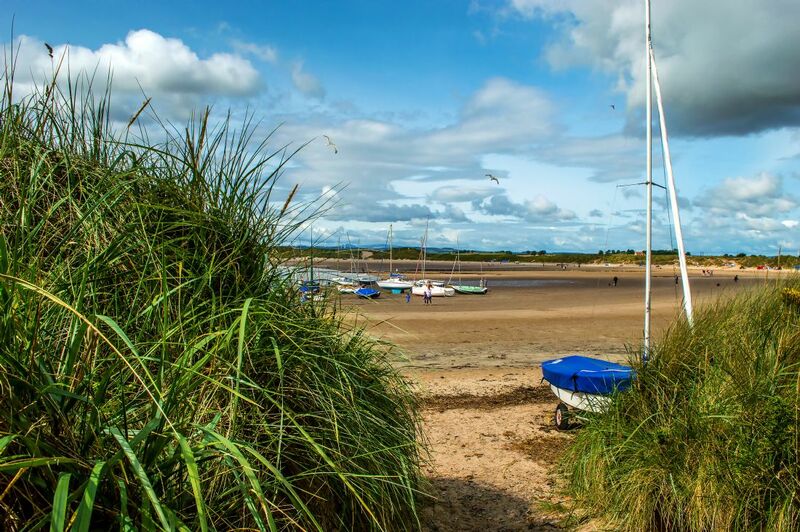 Budle Bay on the Northumberland Coast is one of the most beautiful stretches of beaches, stretching to around 5 miles. It is also part of the Lindisfarne Nature Reserve and is home to large variety of bird life.